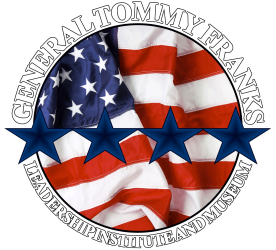 The General Tommy Franks Leadership Institute and Museum is proud to present a new social media event that will recognize a member of the armed forces every Monday! #MilitaryMonday will feature a new service member each week on the Museum Facebook page and Twitter. Highlighted service men and women will be selected via online submissions. We invite everyone to nominate a military member they know by submitting a photo with a brief description using the online form below! Thank you for nominating a military member for the General Tommy Franks Leadership Institute and Museum #MilitaryMonday project. Your nomination will help us recognize the brave men and women in uniform who sacrifice for our country with a salute of respect and gratitude! In the box below, please include a brief description of your nominee, including any information relevant to their service.